Spring has arrived which means that it’s that time of year for a big annual clean! Give your home some much needed love and attention by opening windows and filling your house with fresh spring air, clear the clutter from cupboards and under beds and replace any tired, old soft furnishings. As well as a freshen up inside, it’s also a good idea to ensure that the exterior of your home is maintained and properly prepared for the upcoming scorching sunshine and summer storms. To keep things simple and organised you can start by compiling a list of what areas/rooms require some attention, then put them in order of priority and add their associated costs and timeframe for completion. From here you will be able to determine which projects are most important and which ones can be tackled first. Wash down the exterior of your home and check for any cracks that may need to be repaired. If you feel that a clean is not enough to give the outside a refresh, then maybe you might consider a fresh lick of paint. Giving all your windows (inside also) a good clean makes a huge difference. If it’s a job too big, then maybe hire a professional window cleaner to come out and do the job for you. You won’t believe how dirty the glass was until you see it freshly cleaned and sparkling. Replace cracked or broken tiles that you may find and seal any worn window and door frames. Grab a ladder and clear your guttering to ensure that any excess water can drain properly, but also to reduce fire hazards on the hot, dry days. 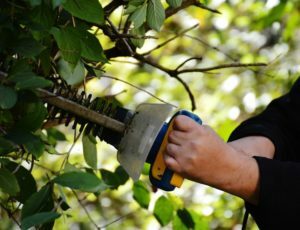 Remove any weeds and trim back overgrown plants and shrubs. Create a herb garden and have a go at planting and growing some fresh, seasonal herbs that you can enjoy in your home cooked food. Uncover and clean outdoor furniture so they are ready to use for family and friends. The warm, summer months provide plenty of opportunities to get outdoors and enjoy your backyard. You can explore bigger makeover projects if you wish, or just stick to one or two of the above ideas. It really depends on the size of your outdoor space and how much time and effort you are prepared to put into the maintenance and upkeep. I don’t know about you, but this time of year I find myself pulling everything out of my pantry and usually discover food where the Use By or Best Before dates have long passed?! I always feel lighter when my pantry has had a big overhaul and is re-organised. The same goes for my wardrobe – although usually I’m not too happy about the weight gain since my last spring clean, and always consider hanging on to my favourite pair of jeans (which I can no longer get into, let alone do up) “just in case”! 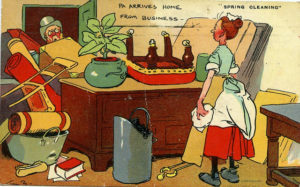 Clearing the clutter is a fantastic way to get your spring clean underway and will give you the space and inspiration to continue your efforts across the rest of your home. You could consider giving your unwanted items to a charity shop, or even hold a garage sale at home to make some extra dollars to put towards your spring makeover. Re-organise and dust bookshelves, cabinets and accessories. You will be amazed at how much dust these places accumulate. Wipe down walls using a sponge with warm slightly-soapy water or sugar soap. Being careful not to soak them and have water running down onto flooring. Clean or replace all filters such as water filter, dryer filter and oven range hood. These should be replaced at least every 3-6 months depending on the filter and the manufacturer instructions. The dryer vent should be cleaned more frequently as this can be a potential fire hazard. Faucets and shower heads can be cleaned by unscrewing them and soaking them for 1 hour in equal parts white vinegar and water. Rinse with warm water after soaking. Check smoke alarms and change batteries as necessary. 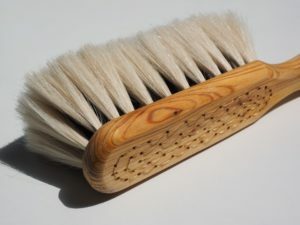 Decluttering, opening windows and a having a big thorough clean will keep mould and dust at bay and will have you feeling fresh and ready for the summer months in no time. Now that your home is clutter free and clean, you can start to organise and sort your rooms to give them a fresh, new look. You may want to rearrange your furniture items to have your space feel completely different, or even move furniture into different rooms. If you are wanting to have a full change and inject a whole new lease of life into a room or two, you could think about experimenting with a new wall colour and/or a fresh new carpet or rug. You could even consider adding a wallpaper to a wall or repaint some furniture. Or maybe you would prefer just to change a few soft furnishings instead? 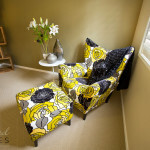 Think about re-upholstering a tired old chair with a fabulously fun fabric or replacing your curtains and/or blinds? Smaller but still noticeable changes would be to compliment your existing colours and furniture with some new spring accessories, such as cushions, throws and bedding. You could replace some photos and frames or re-frame some of your art. Fresh flowers, pot plants and candles are all lovely finishing touches you can add to any space that won’t break the bank. However you choose to give your home a spring makeover just remember that it needn’t cost a lot of money but is important to make it feel like a place to relax and unwind, as well keep it an enjoyable space to entertain family and friends. For professional advice on interior design, decorating or materials for your home or commercial space please contact the team of Inspired Spaces today!